I read this article and found it very interesting, thought it might be something for you. 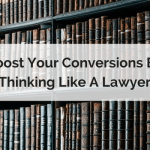 The article is called Boost Your Conversions by Thinking Like a Lawyer and is located at https://copychief.com/thinking-like-a-lawyer/. Add strong proof elements to your marketing materials and watch your sales soar. The young lawyer wrapped up his closing argument. He felt confident in his performance over the course of the trial. As the jury began deliberating, he and his boss walked toward the attorney conference room. He gave the senior attorney a broad smile. “Don’t EVER go in there with just ENOUGH evidence!” the senior lawyer shouted. “You should always have more than you think you need. Because the only people who can decide whether you have enough evidence to win is THEM!” He pointed toward the jury room. 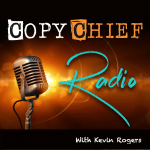 What does a courtroom trial have to do with writing copy? Not just adequate proof, but abundant proof. Because for someone to buy what you’re selling… whether it’s a product, a service, or an alibi… they need a multitude of reasons to believe you. And the more you provide, the more your audience will feel compelled to buy. Because proof is what justifies the purchase. In the classic “4 P” paradigm—promise, picture, proof, push—you’ve already piqued the reader’s interest by the time you get around to your heavy-duty proof. Now you need to make them see that their investment will bring the results you’ve enticed them with. Arbitrary words like “best” or “top” won’t cut it. Neither will generic statements about customer satisfaction. You know this because you’ve ignored these things yourself. So leave that amateur stuff to your competitors. Cut through the clutter by using proof to show you know what you’re talking about. Like the young lawyer presenting his case, you’ll want more proof than you think you really need. There’s no such thing as “too much,” and you don’t have to use it all at once. Because you can repurpose and reuse it over and over, your goal should be to collect as much as possible—at least one form of proof for every claim you make. But don’t limit your proof to just a portion of your body copy. You’ll want to use slivers of it elsewhere throughout. While researching, think about your project from two perspectives. Most of the time, research leads to something (like your big idea). But your search to develop proof elements might also stem from existing claims your marketing materials make about the product. And you need to be extremely thorough. Because one piece of inaccurate proof throws the rest into doubt. Your credibility would be at issue, and your copy will fail. 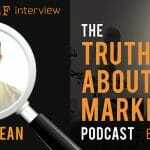 Keep an eye out for these three types of marketing proof to bolster your case. The most persuasive copy will include a mix of them, because different types of proof will be appealing to different people. Data-driven proof is primarily based on facts and statistics. Hard facts strengthen your argument like nothing else can, because they can be demonstrated. Even if you don’t have many facts available about your product, other relevant facts—about the health properties of an ingredient, or the credentials of your expert—can help give you credibility. Experiential proof shows the audience that you know what you’re doing. These details include who you’ve worked with, how long you’ve been in businesses, how many customers you’ve served, and so forth. If your business is young, think about how you can make your previous business experience relevant to your current audience. And of course social (aka third-party) proof is critical. Technology has made it easier than ever for anyone to seek out feedback from their customers. Plus, knowing other users’ experiences makes audiences feel more comfortable buying. An item of proof can be considered more than one type. For example, testimonials (depending on their content) can be all three. This makes them appealing to nearly every reader. There’s no question that prospects find testimonials a compelling form of proof. Here’s how to make yours even more so. The focus should be on your product’s benefits, not its features. And the most important part is the end result. People want to know exactly what your product or service is going to do for them. The best testimonials answer your prospects’ common objections. A straightforward positive testimonial from a happy customer is great… but a testimonial that says something like “I expected [difficulty/objection to using your product], but found [ease of use/solution]!” is better. Customers should be specific about exactly what they did, using what product, what the results were, and how long it took to achieve them. Include as much information about the testimonial giver as possible (name, location, photo, and other relevant details) to increase credibility. The strongest testimonials come from people who are similar to your audience. Get testimonials from customers who fit each set of demographics, needs, and objections of your target market(s). Highlight the key points of every testimonial so even readers who are scanning quickly can understand. If the customer gives future updates, include them beneath the original testimonial. This shows that the product/service continues to deliver great results over time. It also shows that you’re closely connected with your customers. Of course, testimonials are only one way to show that you and your product are trustworthy. You’re going to need more proof than that. Remember, you should be able to support every claim you make. Click here for 13 more ways to add persuasive proof to your marketing, erase your prospects’ doubts, and get them eager to say yes to your offer. Candice had written blogs, brochures, newsletters, and websites even before discovering copywriting a couple years ago. She writes primarily for the self-help and lifestyle industries but has also worked with clients in healthcare, data management, law and education. Candice is a blogger for wealthywebwriter.com. Her articles have also appeared recently in the Barefoot Writer magazine and on b2bwritingsuccess.com. Candice writes content and sales copy mainly for the personal development and lifestyle industries. Her experience as a lawyer helps make her copy strong through the effective use of proof. Candice is a blogger for wealthywebwriter.com and an AWAI Verified copywriter. Find out more at http://www.candicelazar.com. Thanks, Flavia! I’m glad you found it useful. And your tip – always a good one.